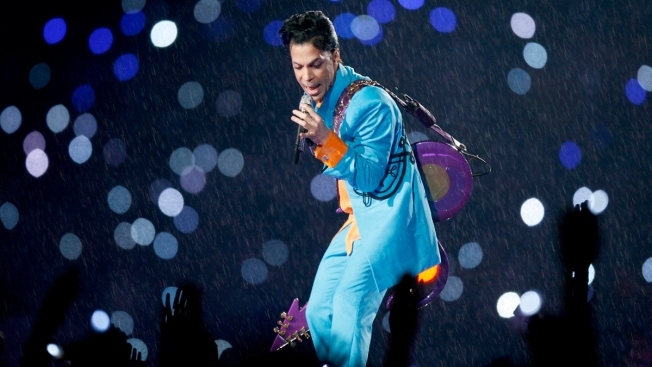 In this Feb. 4, 2007 file photo, Prince is seen performing at Super Bowl XLI. Prince's heirs are suing Walgreens and the Illinois hospital that treated him after he suffered a drug overdose just a week before he died. The wrongful-death lawsuit filed in Cook County, Illinois, alleges a doctor and pharmacist at Trinity Medical Center in Moline, Illinois, failed to appropriately treat and investigate Prince's April 15, 2016, overdose, and that he died "as a direct and proximate cause of one or more ... deviations from the standards of care." Prince was 57 when he was found alone and unresponsive in an elevator at his Paisley Park studio compound in suburban Minneapolis on April 21, 2016. An autopsy found he died of an accidental overdose of fentanyl, a synthetic opioid 50 times more powerful than heroin. At Trinity Medical Center, Prince refused medical tests but was asked what drugs he took. Documents show a pill that he had with him, which was marked as Vicodin, was sent to the pharmacy for testing. A hospital pharmacist said it appeared to be Vicodin and returned it to Prince. The lawsuit alleges the pharmacist and emergency room physician, Dr. Nicole Mancha, failed to timely diagnose and treat the overdose and failed to provide appropriate counseling. "Prince's family wishes, through its investigation, to shed additional light on what happened to Prince. At the same time further light on the opiate epidemic will hopefully help the fight to save lives," the attorneys said. "If Prince's death helps save lives, then all was not lost."